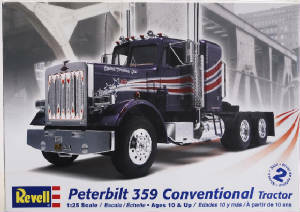 Spare parts for 1/25 Revell model kit #1506, Peterbilt 359 Conventional Tractor. Payments accepted: PayPal, Check, Money Order. Domestic shipping: $0.95 to $4.95 per order. Insurance (optional): $2 (up to $100 value). Email to reserve and for a firm quote including shipping.